Kate Fayloga wears many hats: she is an Assistant Counselor at Tryon Creek, runs cross country at her high school, volunteers with the National Charity League, and has been a Girl Scout for 12 years. 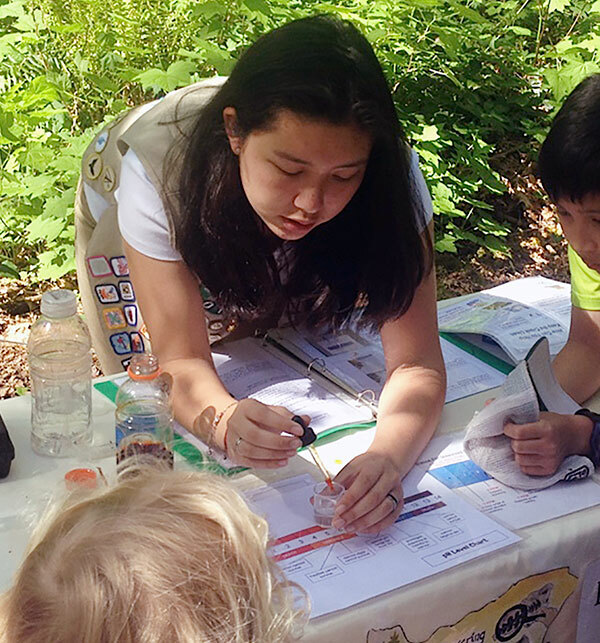 For her Gold Scout Gold Award—the organization’s highest achievement—Kate decided to create a program for Tryon Creek: "Discovering the Park through Science." Kate spent two years developing the program, which enables teens to engage visitors in earth sciences. With support from Park Ranger Deb Hill, Kate assembled six science stations with tools, props and in-depth instructions. The resulting program is place-based and educational. Kate has received numerous awards in recognition of this incredible project, including the President’s Volunteer Service Award and the Girl Scout Gold award, which only 5% of Girl Scouts successfully earn. We want to congratulate Kate on all of her achievements, and thank her for creating an enriching role for teens at Tryon Creek! How does Discovering the Park through Science relate to your goals? I would like to study Earth and Environmental Sciences in the future, and working on this program helped me to learn more about the subject. I have grown up hiking and exploring almost every State and National Park in the Western United States. Both my love for science and my love for the parks drove me to create a program that could help educate others about the science of the parks. What inspired you to develop something for Tryon Creek? I use Tryon Creek as a place to train for cross country, and to go on hikes with my family, and I wanted to give something back to the park because I am always using it. I felt that if I was able to educate others about the park, they would share my love for it as well. When I heard that Tryon Creek didn’t have an ongoing teen volunteer program, I decided to create one so that teens like myself could be more involved in giving back to the parks. How has your family supported you in developing this project? My family was a huge support for me while I worked on the program. My brothers helped me find fossils and rocks that are a part of the fossil and rock identification stations. My parents helped me out with instruction writing, and revisions to the project. Everyone helped me test the stations to make sure the stations were fun and engaging. What has been your favorite part of creating this program? My favorite part of creating this program was learning more about the park and earth sciences. Working and meeting different people in my community to help create the program was also a big highlight for me. When I started working on this project, I really wanted to create a program that would continue beyond myself. Since it’s launch last July, more than 650 visitors have been reached through the program, which shows that visitors and volunteers have found value in the program and that all my hard work was worth it.